So named for its unorthodox winged-top lid that resembles a set of butterfly wings, this vintage Wurlitzer grand piano was built in c. 1937. Of the three butterfly models produced, this particular instrument is a petite 3’9” in length, while the keyboard spans 73 notes (the other models span 44 and the standard 88). While the keyboard length makes the instrument impractical for modern classical works, it is still effective as a beginner’s piano, as well as appropriate for pieces from the Baroque and early Classical periods that were written for harpsichords and forte-pianos with a 4-5 octave range. Designed to fit into apartments and smaller homes without losing the touch and response of a grand action, Wurlitzer also took great care with the cabinet, utilizing the highly popular Art Deco aesthetic (my favorite design style) of the era as an influence in the case design. Built especially for Joe Onofrio III of the Onofrio Piano Company of Denver, CO in 1999, this Baldwin grand is truly one-of-a-kind. The design of the piano was inspired by the local scenery of the stunning Rocky Mountains, which can be seen from the window of the main showroom of the store. The rich browns and reds of the regional landscape are reflected in the unique pommele finish, while the colossal scope of the mountain range is echoed by the broad legs and arches of the pedal lyre. Last, but not least, the mountain vistas are rendered in the beautiful, detailed inlay on the music desk. If the piano won’t go to the mountain, the mountain must go to the piano. 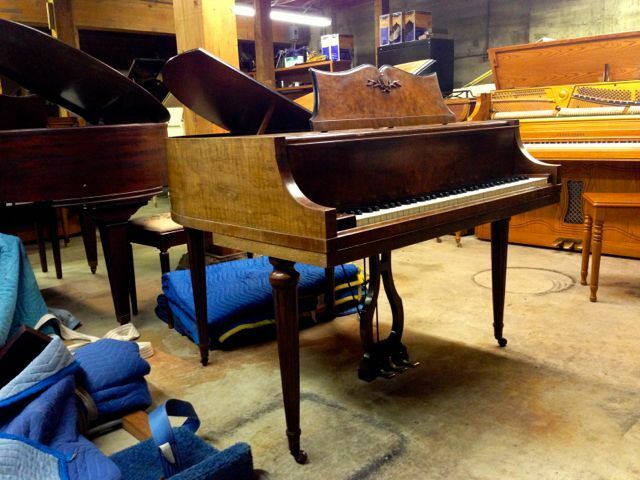 Founded in New Haven, Connecticut in 1850, the B. Shoninger Co. (later the Shoninger Piano Co.) produced this beautiful rosewood upright in 1885 — the year the Statue of Liberty arrived in New York Harbor. Built during the era when pianos were the centerpiece of home entertainment, this full-size upright — a height no longer in production by piano manufacturers — epitomizes craftsmanship. The case is full of intricate, decorative woodwork, especially in the cutout-laden front and lower panels. 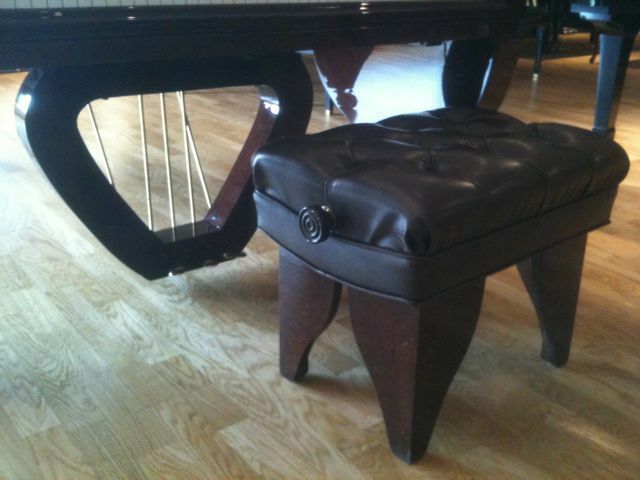 Conveniently, each leg contains a music storage cupboard (hey, it’s easier than standing up and getting it out of the bench, right?). Also distinctive is the sizeable lid ornament containing a carving of German philosopher Johann Wolfgang van Goethe’s face. Note: Piano Profiles is a regular feature highlighting unusual models of pianos that I encounter in my work as a technician. All piano ages and manufacturer details come courtesy of the Pierce Piano Atlas. Built by the now-defunct Sojin Piano Co., a division of Daewoo Inc. of South Korea in 1988*, this Muzelle Studio upright is chock-full of unusual features. The piano has a player system, but one that doesn’t just make the keys of the piano move up and down. It also contains a full percussion system inside for accompaniment, complete with a xylophone, mallets, and a tambourine. 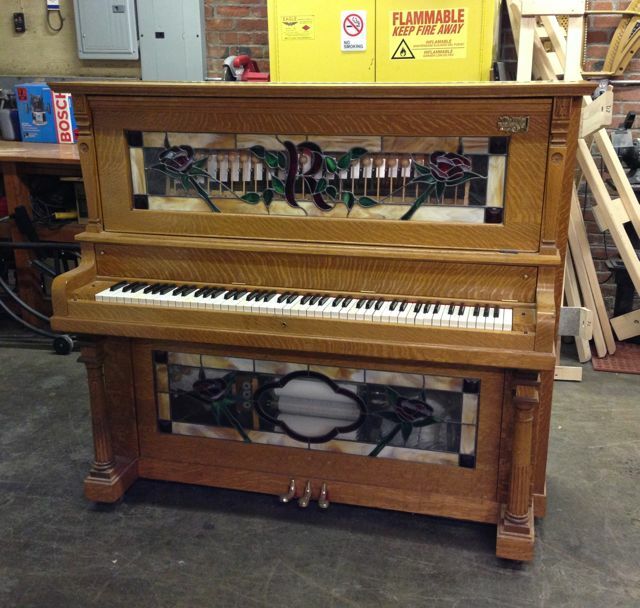 The colored glass panels are a pretty addition not usually incorporated into modern piano cases that allow people to see the player and percussion systems. 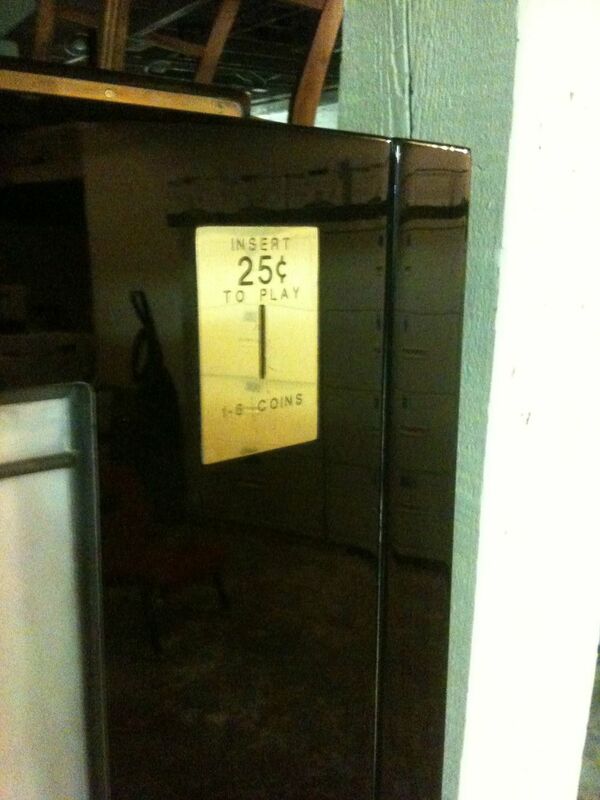 To top it all off, instead of the traditional system of foot pumps or a good ol’ power switch to operate the player system, there is a coin slot. That’s right. This piano will play for money. What the value of such a working instrument is. After numerous inquiries of people in the know, aka player piano experts and piano retailers, I have since learned that a piano with a coin slot is known as a “Nickelodeon” piano, named after an early form of the jukebox. Used models, such as this one currently on display at Classic Pianos in Portland, OR, in good working condition retail for ~$20,000. If anyone is interested in purchasing either of these unique Nickelodeon pianos, please contact me for more information. Thank you, googlers and fellow piano enthusiasts, for piquing my curiosity and nudging me into learning something new!